Welcome to issue 8 of liveartwork DVD, a unique publication showcasing contemporary live art. This issue marks the second year anniversary of the liveartwork DVD publication and I am particuarly pleased to present a great selection of works this issue. There is documentation 'The Institution', a major performance / installation project by André Stitt, one of Europe's foremost performance artists. From last year's SPILL Festival of Performance in London, there is video of Kira O'Reilly's most recent performance work. From Finland there is Oblivia - a relatively new performance group creating unique and beguiling work - and Essi Kausalainen, a young performance artist who makes wonderfully esoteric solo performances. 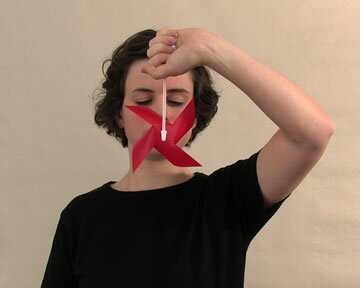 Kate McIntosh presents an extract from her most recent work, 'Loose Promise' and finally Sian Robinson Davies, a recent graduate of the Goldsmiths College in London, presents an object based performance filmed especially for this DVD. Sian also worked as co-camera person on three of the videos which cetainly helps to explain the particurly high quality of video docuementation on this issue. The DVD has a total running time of about 98 minutes. To get a copy of liveartwork DVD issue 8 click on the 'order' link above. Born in Belfast, N. Ireland, Stitt is considered one of Europe's foremost performance and interdisciplinary artists. He has worked as an experimental artist since 1976 creating hundreds of unique works at major galleries, festivals, alternative venues and sites specific throughout the world including the Venice Biennale 2005, BALTIC 2005, The Drawing Centre, New York, 2006 and Artspace, Sydney 2007. He is a professor at the University of Wales. The performance was created as an install-‘akshun’: live work carried out over several weeks in a specially constructed installation re-build & conversion of a series of school classrooms at Chapter Arts Centre, Cardiff. An installation investigating memory and the interrogation of space as a primary vehicle for tracing it’s repression and recovery. Notions of the failure of memory, the irretrievability of past occupation in space - intersection of memory and space. Investigation into the psychology of experience in relation to a nostalgia for the condition of repression. The institution as installation [architectural space] and a site/place for akshun [performative intervention]. A series of rooms [recalled/reclaimed] and, the ability to pass through specifically defined space, a place for things to be recalled, remembered, reclaimed, redeemed. Architectural space as a precondition, an invented and remembered fiction for something else, for something potentially forgotten. These forgotten spaces recalled are emblematic of the inevitable corruption by the institution. Supported by the Arts Council of Wales & Cardiff School of Art & Design. Kira O’Reilly is a UK based artist. Her practice whilst wilfully interdisplinary and entirely undisciplined, stems from a fine art background; it employs performance, biotechnical practices and writing with which to consider the body as material and site in which narrative threads of the personal, sexual, social and political knot and unknot in shifting permutations. Re-negotiating the relationship to audience has been central to generating works, allowing the possibility to make interventions that are sometimes tender, other times troubling, always astonishing. Her work has been exhibited widely throughout the UK and Europe, Australia and more recently China. My body – as a moving, investigating object, articulating a fraught formalism and emotionalism in tense ‘dances’. Mine is a 40 year old non-dance trained body attempting to dance at the edge of some kind of capacity and some unnamed ground; falling, tottering and losing my head in syncopal swoons and deep breaths. It could be thought of as a dance of sorts. Not a real body to dance with. But a sense of sway. In and out of breath. In and out of you. Essi Kausalainen (born 1979) lives and works in Helsinki, Finland. She has worked with performance and visual art since 2000, performing in Finland and abroad. (Trans)Formations is an ongoing series of performances in which I am tracing the moment of change through small transformations and everyday metamorphosis. The other parts of the series have been performed at the Espoo Museum of Modern Art, Finland and in Ensemble of Women Performance Festival in Santiago, Chile. Supported by the Finnish Cultural Foundation and the Regional Fund of Uusimaa. Founded in 2000 in Helsinki, the international performance company Oblivia is a unique force on the Finnish performance scene. Oblivia’s collectively devised, interdisciplinary and minimalistic performances merge the boundaries of art forms and nationalities. The backgrounds of Oblivia’s members from three countries are in performance art, music, dance and theory. This mixture of backgrounds and nationalities creates a vibrant and special tension in the work. From the beginning the core members have been working together creating a common performance language. Guest collaborators are invited to partake in individual projects. 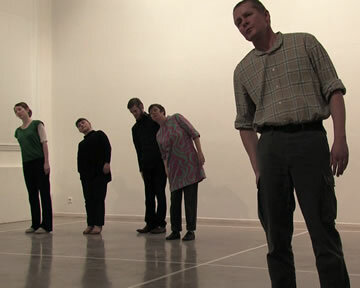 In Spring 2007 Oblivia received the Stina Krooks award for its longstanding commitment to developing work that merges the boundaries between theatre and conceptual art. Five extras find themselves within an unseen epic. They move from scene to scene playing out the background action. Their small but necessary contribution begins to unfurl revealing their place within the bigger picture. The performance contemplates intermediate spaces, being an extra, the dynamics of groups, hierarchies, remnants, gaps and fissures. Through their diligent mapping out of the space and quiet and constant demeanour, we encounter the epic proportions of life itself. Oblivia distils the perception of the epic into an hour long performance. Everything You Say Will Become Dust Anyway premiered at the Kiasma Theatre, Helsinki in August 2007. Lucy Cash (UK), Timo Fredriksson (FIN), Magnus Logi Kristinsson (ISL), Anna Krzystek (UK), Annika Tudeer (FIN). Lights: Pekka Pitkänen (FIN). Originally from New Zealand, Kate McIntosh lives and works in Brussels. She performed as a dancer in several companies before shifting her own work towards theatre, performance and making video. She initiates her own work but also collaborates on many projects, including the music and performance collective Poni. In the past she has worked with people such as Random Scream, Wendy Houston and Meryl Tankard Australian Dance Theatre. Kate McIntosh collaborated with five writers to make the theatre performance text for Loose Promise. She gave each of them the same set of narrative ingredients to start from, but asked each person to write their own version of the story. The result is a collection of beautiful, difficult and compelling narratives. The stories are bound by their shared origin, but they head out in very different and surprising directions. The narratives of Loose Promise create worlds that echo each other, and yet can hardly co-exist. The performance itself, sparked by a fascination with the interdependence of stories, explores our compulsion to keep forming and digesting them. The video features an unedited documentation of the first of the five texts, based on an original text by Tim Etchells. The project LOOSE PROMISE is a commission of 'Telling Time' - a performance festival in the thematic of narrative. Sian Robinson Davies is a three quarters English and a one quarter welsh. She graduated from Goldsmiths Fine Art in 2007 and now lives in Berlin where she has continued to make performances. Moving to a country in which she only has only a basic grasp of the language, has fueled her interested in the relationship between words and objects. Having the speaking ability of a five year old, serves to make language very visible, making word plays and object sentences all the more relevant. The sometimes strange translation of appropriate prepositions from English to German, is a endless source of inspiration. Above Board was originally performed at the Edinburgh Fringe Festival in September 2007. © liveartwork 2006 - 2008. All Rights Reserved.